One of the most prominent cosmetic dentists on both coasts, Michael Kosdon, DDS, joined together with our team at Rosemont Media to develop an advanced new website and comprehensive marketing strategy. Dr. Kosdon set ambitious goals for his new site that were met with a custom website development strategy that included extensive content expansion and development, a cohesive new look and feel, an educational blog, an interactive smile portfolio, intuitive drop-down navigation, appealing lifestyle imagery, and fixed background and parallax scrolling. The end result reflects a polished modern aesthetic, advanced design functionality, and an informative, user-friendly visitor experience. Dr. Kosdon wanted his website to reflect the high quality dental services and remarkable results he is known for while gaining enhanced accessibility and visibility on the web for the procedures he performs. Based on his goals, the Rosemont Media team cultivated innovative website and marketing solutions to deliver an impressive final product. Dental SEO strategies incorporated into the website enable it to perform optimally on search engines so patients browsing the web for cosmetic dentistry services near his office locations can more easily connect with his practice. Furthermore, responsive design elements allow the website to be viewed on any type of mobile device, making it accessible to searches performed on a smartphone, tablet, laptop, or desktop computer. When visitors are welcomed to the website, the elegantly designed homepage presents an inviting introduction to several fundamental aspects of the practice and draws the visitor inward to discover more. Parallax scrolling and interactive photo gallery elements combine to make the site stand out as an impressive display of modern website innovation. 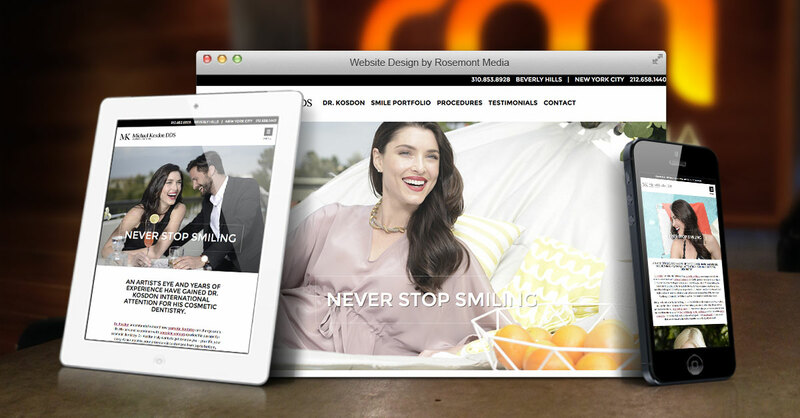 Rosemont Media is constantly evolving and advancing to remain at the forefront of dental website development and marketing. From the initial design consultation to website launch and beyond, our team works efficiently and effectively to meet the unique goals of each client. To view the type of customized website Rosemont Media can build for you, we invite you to visit Dr. Kosdon’s new site at www.drkosdon.com. If you are interested in finding out how we can transform your online presence with a custom website and marketing package of your own, please contact our office today.